Historic Rosemont Manor recognizes the need for executives to meet outside the confines of the board room. 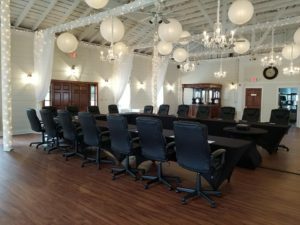 Our elegant Manor House, Carriage House, and Studio give you several on-site options, and make Rosemont the ideal venue for your business meeting or multi-day corporate retreat. We understand your need for convenience, confidentiality, and privacy in a setting that inspires productivity and creative thinking. 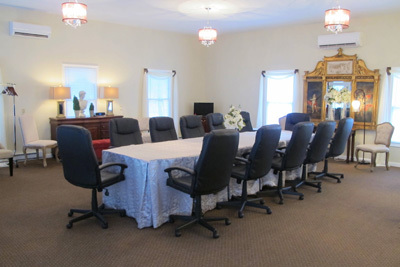 Historic Rosemont Manor can accommodate various configurations for different forms of business meetings or gatherings. The main floor public rooms in the manor as well as the studio can be used by smaller groups as breakout space or for varied dining options. Wi-fi access is available throughout the Manor House, Carriage House, and Studio. Upon prior arrangement Rosemont can provide any additional equipment that your company may require for your meeting or presentation, for an additional fee. Additional business services can be arranged upon request, such as faxes, copiers, wireless computer networking and internet connectivity. Name badges, legal pads, and pens or pencils can be provided for all attendees. Please inquire when arranging your business meeting or retreat and we will include all details in a personalized, comprehensive proposal package. With such a lovely country setting, we at Historic Rosemont Manor believe it would be a shame to schedule all of your time in meetings and presentations. We can arrange recreational programs designed to foster team bonding and relaxation, such as hiking, horseback riding, canoeing, whitewater rafting and golf, all weather permitting, of course! For more refined pursuits, we can arrange wine tastings, historic tours, or attending a performance at a local theater. Ladies and gentlemen, bring your spouses! We can arrange a day at the spa, a shopping trip to local antique shops, an old-fashioned barbecue, horseback riding, or an excursion to the Appalachian Trail or nearby caverns. So whatever your needs for your corporate events, let Historic Rosemont Manor be a partner in exceeding your expectations. Click to check out more photos of our Northern Virginia corporate event spaces and amenities here at Rosemont. For inquiries or more information on holding your corporate event at Historic Rosemont Manor, please call 540-955-2834 or email corporate@rosemont1811.com.